The earliest people to inhabit this area were called Basketmaker. This was because they wove distinct baskets. These people grew corn, squash, beans, and tomatoes from seeds that they acquired by trading with Mexico. Before long, more and more food was available. As a result the Anasazi prospered. Soon people began living in pit houses next to their storage rooms. Then between 500 BC and 600 BC the Anasazi began living above the ground. 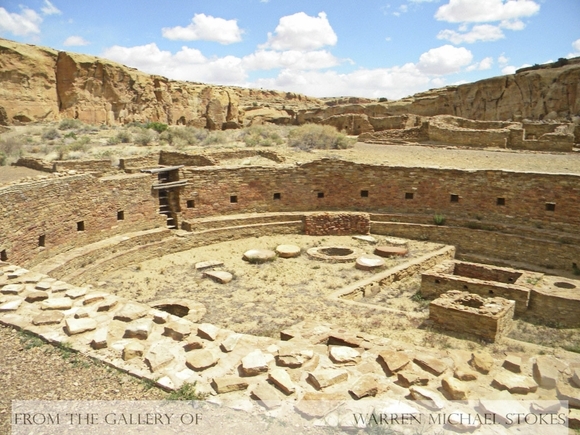 By 850 AD, the Chacoans began building large, multi-storied complexes called great houses. Pueblo Bonito is probably the best known of these great houses. It is the largest Southwest Native American building ever excavated, and at one time contained between 600 to 800 rooms. Pueblo Bonito was constructed in the form of a giant D, and it was between three and four stories high. Chacoans used over 225,000 logs during the construction of the pueblos. Many of these 500 pound logs came from as far as sixty miles away. Chacoans did not go very far for their rock and mortar. They used mud for plaster, and quarried dark sandstone rock on the mesas above the canyon. During the last stage of construction the Chacoans plastered their interior and exterior walls until they were smooth. The plaster protected the walls from erosion. Walls were painted in colors of either red, white, or a turquoise blue. We now know that Chaco Canyon was once called home by many indigenous cultures that spoke many different languages. The Hopi of Arizona, the Pueblo people of New Mexico, and the Navajo all claim to be descendents of Chaco Canyon. Ancient Chacoans constructed hundreds of miles of road ways that linked them with cultures from as far away as Mexico. In the early 1100's a fifty year drought set in, making life very difficult. The people that inhabited Chaco did not just vanish. Instead, they moved on to areas that became more hospitable. However, when another major 25 year drought arrived in 1275, it is believed that every single person left the area for good. Eventually, they would evolve into the Hopi, Navajo, Pueblo, Toltec, and Aztec cultures. Chaco Canyon was rediscovered by a United States Calvary Expedition in August, 1849. The first pueblo they discovered they named Pueblo Pintado for the painted plaster. The next significant expedition to Chaco Canyon was in 1896. It was called the Hyde Exploring Expedition and it was financed by Talbot and Frederick Hyde. They were not disappointed. One room alone was filled with 114 pottery jars and 18 pitchers. It took them four years to excavate 190 rooms and kivas at Pueblo Bonito. They found flutes, baskets, more than fifty thousand pieces of turquoise, ten thousand pieces of pottery, bows and arrows, and thousands of stone implements.